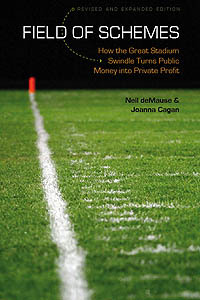 This entry was posted in apocalypses, Miami Dolphins, Minnesota Vikings by Neil deMause. Bookmark the permalink. Been covered by other publications, but it’s no coincidence that the Vikings’ first game at their new venue was contested against a team currently looking for their own new home. FOX’s broadcast tandem (including San Diego’s own John Lynch) spent a solid two minutes doing all the bidding on the Spanos family’s behalf regarding the stadium vote in SD. It’s shameless and spineless as can be, but at this point, it’s also naive to expect anything different from the Chargers, the NFL, and anyone the league decides is worthy of getting broadcasting rights or media credentials. Do you recall when in the broadcast this happened? I DVR’d it to get a look at the stadium, and I don’t want to watch the whole thing, but I definitely want to hear this brazen nonsense. Wow. “If you wanna be a big-time city, I think you gotta hold on to these teams, and once they leave, they aren’t coming back.” It’s truly amazing to me that people still speak in these terms in 2016. Right up there with debating which cities “deserve” or “don’t deserve” a team. I know it is unrelated to the new Minnesota stadium, but had the misfortune of listening to the Falcons game last night on a local broadcast and the full shill was in effect. Rich McKay came on at halftime and was sickening. Finally saw the first PSL/seat commercials, they were nauseating. Looks like the roof did a good job of letting sunlight through as it almost looked like an outdoors game except for some shadow stripes. When it was cloudy the game looked like a dome game. OH NO, loud noise at a stadium? then do not come to CenturyLink Field in Seattle, you may get an ear ache! The ETFE roof makes it the nicest fixed roof stadium ever built with the natural light. I haven’t heard anything on the other uses it’s supposed to handle in lieu of the Metrodome. Somehow I see the Vikings ending up charging $40 per runner in the winter and keeping all the $. Yeah, it’s “shameless and spineless” to advocate for something you believe in and that you think will be a good use of government resources. Deadspin covered it pretty well, but I think it is pretty shameless and spineless to go off on a political issue like a major tax hike to pay for a government project that almost entirely benefits a small segment of the population (NFL game attendees and hugely benifits one NFL owner in the middle of a game. Perhaps instead they should do some sort of demonstration during the national anthem, that seems a more appropriate time for a political demonstration. Oh, and the “once they are gone, they don’t come back” is false. With a seconds thought I can think of Cleveland, LA, St. Louis, Baltimore, and Houston. Plus, what shocks me, is the amounts they ask for, and also that they have a stadium already. Why do these stadiums have to be over a billion dollars; it’s just insane. The audacity, that’s the shameless part, and the false narratives; that’s the spineless part. Not that I do $300 for a hotel room (I’d guess most Americans never stay in hotel rooms that nice), but this would throw me to VRBO for sure. And good on Neil ignoring the $600 million or so that the Vikings & the League are paying towards construction & operating costs. Didn’t ignore it at all. Pretty much all of that will be reimbursed via property tax breaks and other goodies. Follow the link I provided. The stadium is a government building, Neil. The Vikings simply have the lease, which they are paying rent on. In no logical way are the Vikings getting a “property tax break”. For fun, though, let’s stipulate that you can count the fact that the Vikings play in a government owned stadium as a “property tax break”. In that case, then the stadium price is well above $1.1 billion. It’s a building that belongs to the government specifically so that the Vikings wouldn’t have to pay property tax on it, since everything else about the deal — who gets revenues from the building, controls usage, owns the naming rights, etc. — is what you would expect from a privately owned venue. Not all gifts come in suitcases full of small bills. As for “then the stadium price is well above $1.1 billion,” you’ve lost me there. If you want to say that about tax-exempt bonds, fine, because there the subsidy is in the form of cutting the annual price tag of paying off the building. But if Wilf is spending $500m, and then receiving $500m in reduced property tax payments, how is he out anything? This stadium is “ten times louder than the volume at an average NFL stadium”? That can’t be right. If any NFL-approved commenter has spent three minutes contemplating what is a ‘good use of government resources’ I would be astounded. They speak the lines they are given; if they don’t, they are out. Do you really think that any commenter who disapproved of government-subsidized arenas would get time on the airwaves? The first time would be the last. Yep. The NFL tolerates some controversial political commentary, but not on this subject. This season, announcers will be forced to comment on Colin Kaepernick, and I expect many will defend him, repelling a large part of the NFL audience (military, police, their families/supporters) in doing so. Bob Costas regularly uses his NBC microphone to lecture us on everything from gun control to climate change to race relations. Which is all apparently A-OK by the NFL. But if any NFL announcer were to criticize a city for spending $500 million of taxpayer money on an NFL stadium, instead of infrastructure, public safety, education, etc., that person would soon be out of a job. No room in the NFL for “controversial” opinions on that political subject.